I have spoken about my dental issues before. I drink a lot of coffee and enjoy the occasional glass of red wine, so on top of my periodontal disease, I have quite a bit of stains. I have also been having issues with my regular dentist. I honestly had a ton of anxiety every time I would go because the pain after a terrible extraction. And then it got to the point where it had been over two years and I still hadn't gone back. When I finally did go back, that's when I had periodontal disease. Besides a special mouthwash, it was recommended that I get an electric toothbrush. Since I have pockets and was having issues getting my back teeth with a manual brush, my dentist had recommended an electric toothbrush for a while. 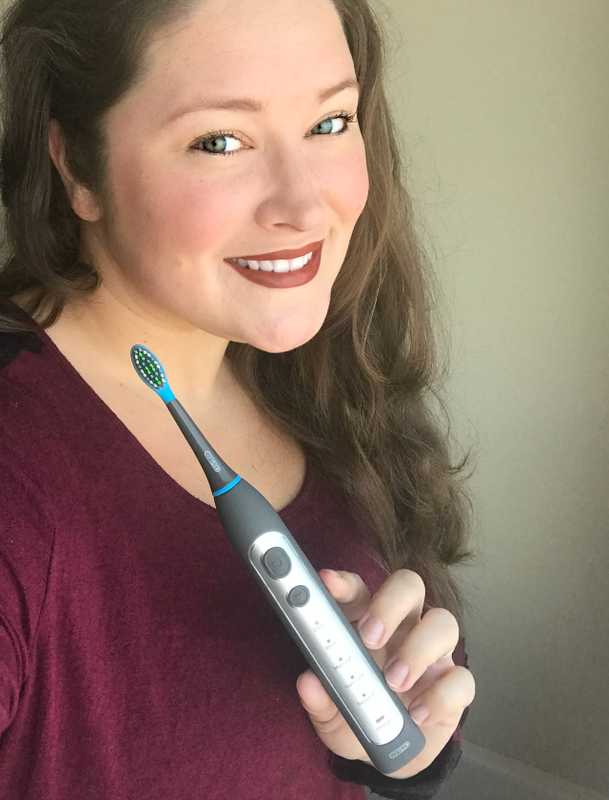 I put off getting an electric toothbrush for myself (my husband had one) for so long because I really didn't want to spend all that money and I didn't believe it would really make a difference. You might remember that I worked with Smile Brilliant on their infamous at-home teeth whitening system a few months back. 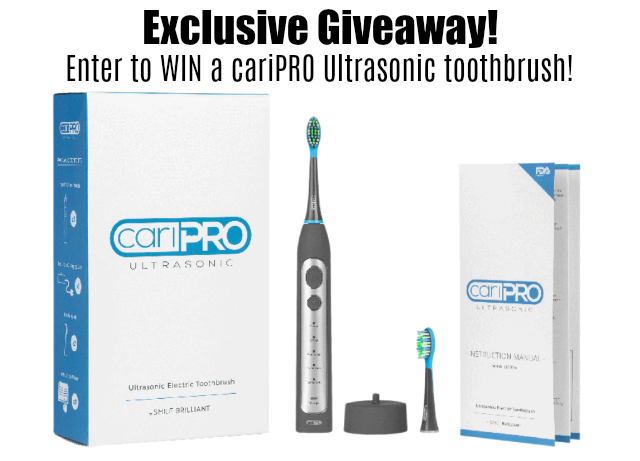 So when I received the opportunity to test out their cariPRO electric toothbrush, I was skeptical and intrigued because I have tried other electric toothbrushes before. I honestly was thinking this one was cool and it would be better than a manual, but how could it be any different as other electric toothbrushes out there? The difference is in the settings. My favorite setting to use regularly is the sensitive setting because I do have periodontal disease and the whole reason I encourage self care. But when I use the "white" setting, I feel almost like I have been to the dentist for a cleaning. My teeth feel so smooth and I can feel like there is less tarter build up for sure. I love that there is a pulse system so you know to brush for two minutes. 1. Gentle Brush Strokes. Harder is not better. Gentle brush strokes are better for your gums. You want to massage your gums, not damage the gum tissue. Hard brushing can cause a receding gumline. 2. Angle at 45 degrees. Place the toothbrush at a 45 degree angle and brush along the gumline. Move brush inside to outside of each row for full cleaning coverage. 3. Brush All Four Corners. To select a mode, simply push the button until the desired mode lights up (Clean, White, Massage, Gum Care, Sensitive). Each mode is designed to operate for two minutes, 30 second bursts at a time. 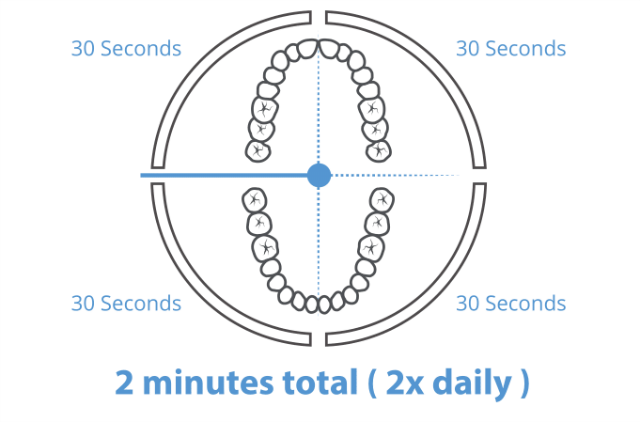 At the end of every burst, move brushing to a different quadrant of the mouth. 4. Maintain Your Enamel. Your enamel is the visible part of the tooth. Wearing it down can result in tooth decay and increased sensitivity. To prevent enamel erosion, avoid using abrasive toothpaste, brushing too hard, and wait at least 30 minutes after eating and drinking to brush. 5. Floss. In addition to brushing, it is important to also floss to help remove any food particles or decay-causing plaque. 6. Using the Correct Toothpaste & Mouthwash. Smile Brilliant highly recomends using non-abrasive toothpaste in order to maintain your tooth enamel. They also recommend the use of alcohol-free toothpaste and mouthwash. Toothpaste and mouthwash containing alcohol can be toxic, drying t the mouth's soft tissue, and can increase bacteria levels which causes bad breath. 7. Brush or Scrub Your Tongue. Fight bad breath by brushing your tongue with the brush head or by using the tongue scraper on the back of the brush head. 8. Regular Checkups with Your Dentist. Nothing beats regular visits to your dental office. Along with these other tips, cleanings and checkups will help you maintain a long-term, healthier, and brighter smile. The cariPRO is already an amazing, AFFORDABLE option with the same features of the highest quality electric toothbrush on the market. 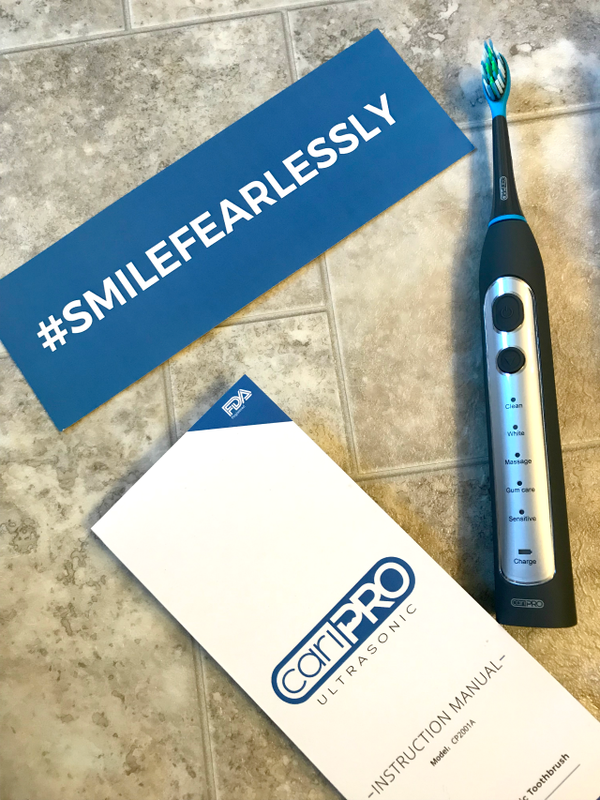 But Smile Brilliant and I want you to have a beautiful smile this holiday season, so they have graciously offered my readers 25% off cariPRO Ultrasonic electric toothbrushes with code "nannytomommy25". This sounds like a really nice toothbrush. I am going to look into these further for us. These are some great tips! I have always disliked the color of my teeth. I had a ton of teeth & mouth issues when I had radiation, chemo, Aredia, for treating the cancer Multiple Myeloma. After my mouth sores healed and I could finally brush my teeth again, I was told to buy an electric toothbrush with different settings. My oncologist described it as an investment and it was! For a while, everything was fine and my mouth was feeling better. The toothbrush helped with the massaging and the bleeding of my gums. I’ve always brushed my tongue. Unfortunately, the cancer is returning and I lost all of my teeth. After the stitches fell out and my gums healed, I use the sensitive setting to massage my gums. I pinned this. Thank you for sharing! I've been trying to whiten my teeth. Trying an electric toothbrush sounds like a good idea.